One of the most effective ways to guarantee the security of your home and property is with a good quality gate. Gates are useful in protecting against unwanted visitors and are also effective at keeping small children or pets from running onto the road. Unfortunately, many gates across Brisbane are mass-manufactured and can make your property look more like a prison than a home. Here at Dean Wilson Iron, we have recognised this and developed a solution: handcrafted, custom-made wrought iron gates. We understand that you want a gate that reflects your own personal style, as well as the design features of your house and we specialise in delivering stunning and intricate designs that are personalised to suit your specifications. Our philosophy is simple: to create striking and elegant wrought iron gates that do not compromise on strength, quality of practicality. We have found that wrought iron is the perfect material with which to construct our unique gates as it offers many properties that other materials simply do not have. Wrought iron is unrivalled in terms of strength and all of our gates are manufactured from solid wrought iron, meaning that they are capable of withstanding extreme pressure. Because of this, they guarantee you the upmost in security and functionality. Wrought iron is also very ductile and malleable, which allows us to fashion it into intricate, unique and stunning designs that are sure to be the focal point of your home. In addition to this, wrought iron is very durable and can easily withstand the harsh climate of Brisbane. 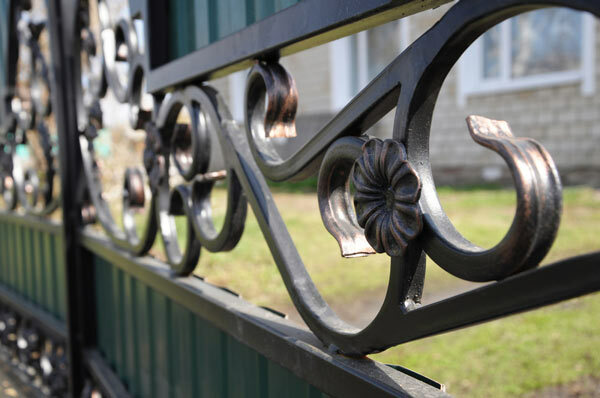 We treat all of our iron prior to use, in a way that safeguards against rust and corrosion, so your gate can maintain an immaculate finish for decades – allowing you to showcase your unique and timeless style for many years to come. To create a true presence in your entry to your Brisbane home there are few better options than hand crafted and styled wrought iron gates. Here at Dean Wilson Iron, we feel that your gate ought to leave an impression; it should reflect your own personal style and complement the design features of your house. Gates serve a very important practical purpose as well, however, and for this reason we have taken many measures to ensure that our gates are the most functional in Brisbane. Our range of gates is limitless and we custom make each of our products to perfectly suit our client’s requests. We can provide anything from classically designed driveway gates that add an air of grandeur to your home, to personal pedestrian gates that elegantly adorn the boundary of your property. We even craft customised pool gates to give your recreational area a designer touch. We have an uncompromising dedication to quality and as a testament to this we guarantee our products for ten years. Wrought iron is renowned for its timeless elegance, however that does not mean that it cannot be used effectively for modern purposes. At Dean Wilson Iron, we demand the best for our clients and this means offering a perfect combination of quality, design and practicality. To offer you the upmost in convenience, we can automate all of our gates using the latest electric motor technology and we can install intercom systems and electric release strikes. This will greatly enhance not only your convenience, but also your security; you will have complete control over who enters your property. Our services are aimed at addressing your needs individually and this is why we custom build each of our gates to your specifications. We will work closely with you to develop a detailed plan that is targeted at fulfilling your requirements and creating the perfect gate for you. We strive to account for every detail – no matter how small it may seem – and to do this we will work closely with you and discuss your situation to develop a unique and targeted design. Here at Dean Wilson Iron, we strive to provide unrivalled gating solutions and to ensure that you are getting the best in quality, design and functionality, we have developed a targeted service approach. Our process is designed to help you explore the various options and designs that suit your needs and allow you to craft a personalised, attractive and top-quality wrought iron gate. To ensure that we are aware of all your needs, we like to begin our service process with a brief consultation. Firstly, we like to discuss your needs with you. This is a great opportunity for you to present us with any design concepts you may have, or outline any of your concerns. We custom make each of our gates to perfectly suit you and because of this, we will need some details on the area in which you are looking to install the gate and the purpose you want the gate to serve. Once you have decided on a design, we can use that and some rough measurements to provide you with an instant quote. We understand that you do not want to commit to anything without first considering it and this is a great time for you to assess your options. Once you have an idea of a design that will best address your personal needs, we can discuss the purpose and practical function of your gate. 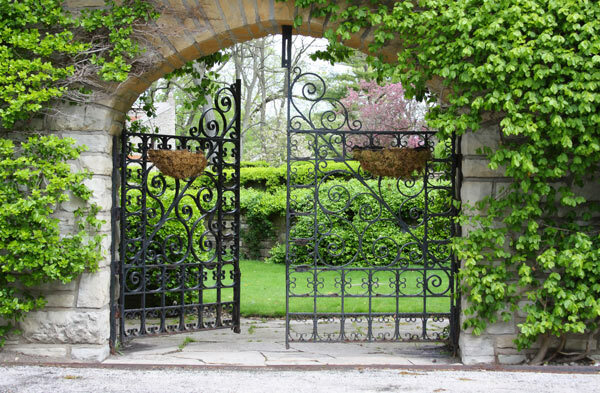 We like to combine the timeless elegance of wrought iron gates with the modern convenience and safety of technology. Because of this, we offer a range of automated systems that will keep you in control of your gate with the upmost convenience. We can make your personalised gate fully automated with an electric motor and we can install an intercom system and electric release strikes so you will have full control over your gate at all times; we even offer electronic locking systems. This is great not only for you convenience, but also for the security of your home. Here at Dean Wilson Iron, all of our gates are fully customised to your specifications. To ensure that they are unrivalled in terms of practicality and quality, we make them specifically for installation in an area of your choice. With customised measurements and design, you can rest assured that your gate will be fitted to perfection. This is important not only for the aesthetic appeal of your gate, but also for its strength and durability. By handcrafting your gate to exact and unique measurements, we can ensure that it will be installed in a manner that complements its unrivalled strength, whilst maintaining an immaculate finish. If you require a unique and targeted gate for your home then contact us to day at Dean Wilson Iron. We pride ourselves on offering comprehensive and personalised services to bring you stunning designs and unrivalled quality. You can see evidence of our work throughout Brisbane on Facebook and we encourage you to contact our team if you have any queries or would like to explore your own wrought iron design concepts. #1 How do you ensure the best quality in your gates? At Dean Wilson Iron, quality is one of our foremost priorities and we take many precautions to ensure that your gate is of the highest quality possible. We use the strongest, most durable wrought iron for the best in strength and longevity. To make sure that your gate will not rust, our experts use a specialised approach that includes sandblasting the metal, applying a corrosion resistant zinc layer, then a decorative powder coat or hand-rubbed natural iron finish. This will safeguard against rust effectively for many years to come. #2 What do I need to consider when thinking about designs for my gate? Choosing a design is a matter of personal preference; we believe your gate can be a personal statement that reflects you own style and complements the design features of your home. We will help you explore the many design options that are available to you and we are happy to provide you with advice to ensure that your gate has the perfect personalised design that offers you the upmost in strength and quality. #3 Will my gate come with any guarantees? We handcraft each of our wrought iron gates to the highest standard of quality and durability. 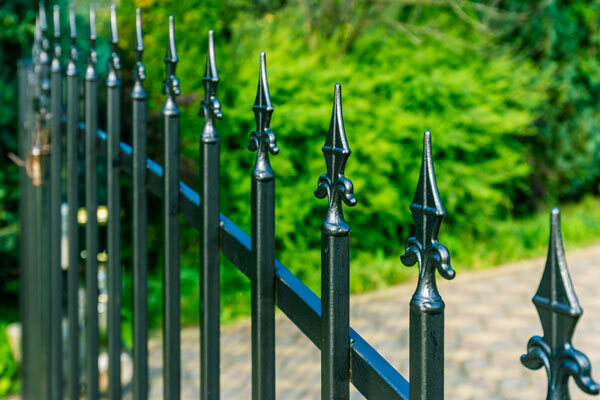 Our entire process revolves around giving you the best wrought iron solutions and to do this, we take many measures to ensure that your gate maintains an immaculate finish for years to come. When crafted correctly and maintained well, wrought iron gates can last you for decades and as a testament to this, we guarantee all of our gates for ten years. #4 Does it take long for you to make a custom gate? We make every one of our gates by hand to suit our clients’ specifications and this means that it is ideal to allow as long as possible. Usually, 6 to 8 weeks provides us with sufficient time to handcraft a top-quality, unique gate that perfectly addresses all of your needs. If you contact us while you are still designing your house or renovation, then we can often craft your custom wrought iron gate in line with your schedule for your convenience.